• Experience crystal-clear sound with a sleek, behind-the-head design that’s comfortable to wear. Plus, the built-in microphone and in-line volue controls make listening and speaking a pleasure. 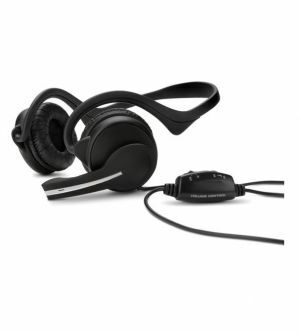 • The HP Digital Stereo Headset features plush earpads with behind-the-head design for comfortable, convenient use. • The headset offers a simple plug-and-play setup with no software needed, plus USB connectivity. • Get exceptional sound thanks to the high-quality acoustics; the noise-cancelling microphone reduces background noise for clearer conversations, and rotates out when not in use. • It's easy to adjust the microphone volume or mute the sound altogether, thanks to the inline volume control.